We have a large variety of models for a wide range of temperature and humidity and different memory ranges. One of the major uses of these data loggers is for health care logistics. There are numerous models with internal and external sensors for temperature. there are different models with memory capacity from 16000 to 128000 readings. There are different models with internal and/or external temperature sensors. The humidity sensor type is internal. There are 4 visual alarms ie. 2 on the higher side and 2 on the lower side.The visual alarms are by LEDs of different colours. We can program these with a sampling interval from 5 seconds to 17 hours. Temperature measurement range is from -40 °C to +80 °C (-40 °F to +176 °F). For applications such as refrigerators, it is ideal to insert the external temperature sensor into a glycol bottle to reduce sudden fluctuations due to frequent door openings. We offer a warranty period of 2 years against manufacturing defects. 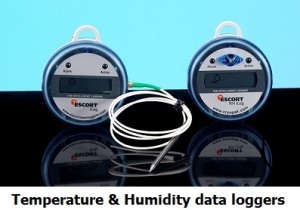 The following models are available in this series of temperature & humidity data logger. 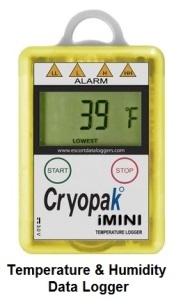 This is a Temperature & Humidity Multi-use data logger with an external sensor. It has 3 sensors viz. 2 Internal & 1 External sensor (1 no internal temperature sensor, 1 no. external temperature sensor, 1 no. internal humidity sensor). Types of sensors are Digital sensor & NTC. Memory capacity is 16000 readings (higher models with capacity up to 128,000 readings are available). 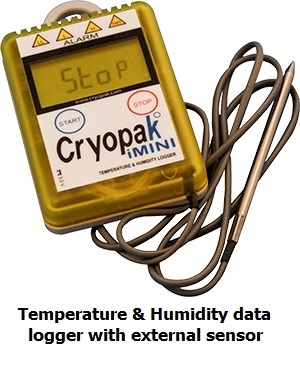 This is a Temperature & Humidity Multi-use data logger with an internal sensor. There are 2 nos sensors, viz 1 no internal temperature sensor and 1 no. internal humidity sensor. The type of sensors is Digital. Memory capacity is 16000 readings which mean 8000 readings of temperature and 8000 readings of humidity (higher models with capacity up to 128,000 readings are available). It has a memory capacity of 32,000 readings. It has an inbuilt LCD display with the capability to view different functions. There are Visual and audible alarms for high and low alerts. It has a function to bookmark times so that the customer can mark different events during recording. It offers a wide temperature range of measurement. This data logger has an accuracy of ±0.35 °C. This is a Temperature & Humidity Multi-use data logger. Measuring range is from -40°C to +70°C (-40 to +158 °F). It has 2 nos sensors, viz. 1 no internal temperature sensor and 1 no. internal humidity sensor. LCD Operating Range is from -20 °C to +70 °C (-4 °F to +158 °F). The customer can program recording interval from 5 seconds to 10 days. It has a Resolution 0.1 °C / 0.1 °F / 0.1%. The device has a battery Life of 1-2 years depending on usage. 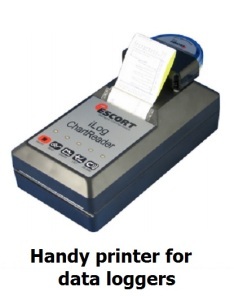 This chart printer is for downloading and printing data from iLog series of temperature & humidity data loggers. This does not need a computer. The printer has a rechargeable battery. A driver can easily use this to download the data from the data loggers during the delivery. The chart printer has a memory capacity of 1 MB for downloading the data from data loggers. The printout includes various details such as serial numbers, the number of readings, sampling frequency, start and stop time etc. This is the latest addition to our range of products. This is a single use disposable type data logger for temperature & humidity. It does not have a display screen. Once the start button is activated, the recording starts. Once you decide to stop recording, you can do so and download the entire data through a computer. Also it has LEDs to indicate if the readings have crossed either the upper or lower threshold limits. Please see the video of single use temperature & humidity data logger. If you want to record temperature only, please click to see our Temperature Data loggers.